In stock -This product will ship today if ordered within the next 14 hours and 51 minutes. Green People Organic Babies Lavender Baby Wash & Shampoo natural bath wash and shampoo for your little one. This natural baby wash is made without Parabens, Lanolin, phthalates, artificial perfumes, petrochemicals and colourants to bring you the purest wash that nature can offer. The plastics and all of the packaging materials that Green People use are checked, assessed and approved by Soil Association, Organic Food Federation and EcoCert, each of whom have very strict standards on the environmental impact of cosmetics and their packaging. All Green People plastic packaging is made of either PP or PE plastics, both of which are 100% recyclable. Modern recycling processes mean that both of these can be recycled many times, not just the once. Work to a mild lather and wash baby’s skin and hair. Rinse gently. Avoid contact with the eyes. Follow with either Mum & Baby Moisturiser, Baby Lotion or Baby Salve. 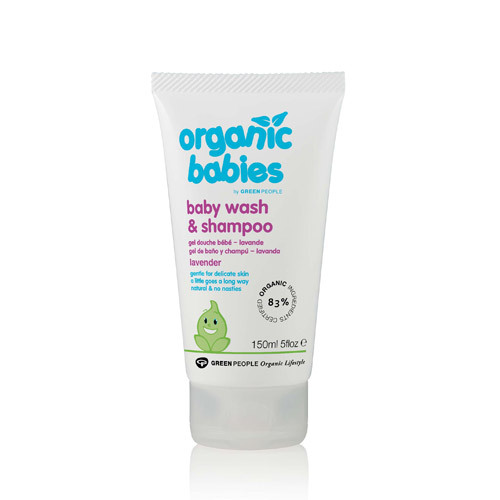 Below are reviews of Green People Organic Babies Wash & Shampoo - 150ml by bodykind customers. If you have tried this product we'd love to hear what you think so please leave a review.